As a member of the Agavaceae (agave family), some of its common relatives include dracaena, tuberose and yucca. 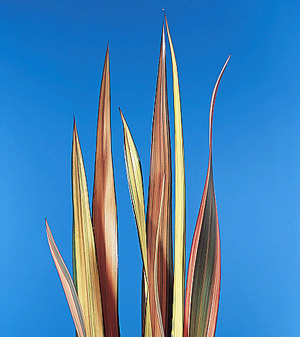 Leaves are up to 36 inches long, narrow, pointed and often multicolored. Plant is a herbaceous perennial, classed as a monocotyledon. From the Greek “phormion” (mat) referring to the fiber produced from the leaves. The specific epithet name tenax means strong or tenacious, referring to the strong fiber. Important species for its leaf fibers. Good for linear aspects of design, works well with tropical flowers.